Push to Walk, a non-profit organization that provides individualized workouts and resources to people with spinal cord injuries and other forms of paralysis, will host their 9th Annual Casino Night featuring a Texas Hold ‘Em Poker Tournament on the second Saturday in March. We hope that our past participant special will allow us the opportunity to introduce Push to Walk to many more in 2018. 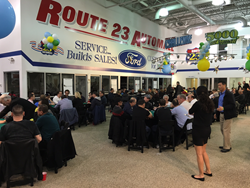 Taking place at the Route 23 Auto Mall in Butler, New Jersey on March 10, 2018, the entry fee is $150 for poker players and $50 for spectators (entry fee will increase to $175 after March 3, 2018 so register early!). Both entry fees include a buffet dinner, wine and beer. Players who register online at http://www.pushtowalknj.org will receive a 1,000 chip bonus. The organization is running a special deal, which offers a $50 discounted tournament entry to any 2017 Casino Night participant with the commitment of a registering newcomer. Doors open at 6:30PM, and the first card will be dealt at 8:00PM. Push to Walk’s clients pay an hourly fee for personalized training. These fees do not fully cover operating expenses. The balance is obtained through fundraising activities, grants and donations. Funds raised through events like Casino Night help the organization offset expenses and focus on providing the highest quality program to the paralysis community. Push to Walk uses exercise trainers certified in methods known to help people regain strength, function and independence and provide one-on-one workouts to their clients. This program is unique to the area and is the only one in New York/New Jersey. Sponsorship and donation opportunities are available on the Push to Walk website: http://www.pushtowalknj.org. For more information, please contact Stephanie Lajam at (201)644-7567 or slajam(at)pushtowalknj(dot)org. Photos available upon request. Founded in 2007, Push to Walk is an organization that provides individualized workouts and resources to people with spinal cord injuries and other forms of paralysis to optimize current quality of life and to prepare for future medical advancements. It is the only program of its kind in the New York- New Jersey area. Push to Walk’s rigorous one-on-one workout approach challenges clients to reach their personal goals and achieve maximum independence, leading to greater success and fulfillment in their personal and professional lives. A 501(C)3 non-profit, Push to Walk is located in Oakland, New Jersey. Visit http://www.pushtowalknj.org to learn more.